Dubbed the “final chapter” in Fox’s prequel trilogy – for now, at least – there’s a profound sense of magnitude and importance resting on the furry shoulders of War For the Planet of the Apes. And it’s not hard to see why. Both Dawn and Rise drew praise for the ways in which they balanced spectacle with a sophisticated, fiercely compelling narrative – the franchise’s box office total is a testimony to that feat, too, which currently stands at $1.1 billion – but with War For the Planet, Matt Reeves and Fox’s threequel looks set to tip the scales ever so slightly in favor of a full-blown conflict. That’s not to say that both parties have engineered a big, loud, and dumb blockbuster, far from it; merely that War For the Planet of the Apes has raised the stakes so high that it’s small wonder why it’s been hailed as the darkest entry in Fox’s saga yet. After all, the tension between humanity and those radically evolved simians has reached an all-time high. Fighting for apes and his own twisted sense of revenge is Andy Serkis’ glowering Caesar, who has grown to become a full-fledged Messiah figure for the surviving simians. 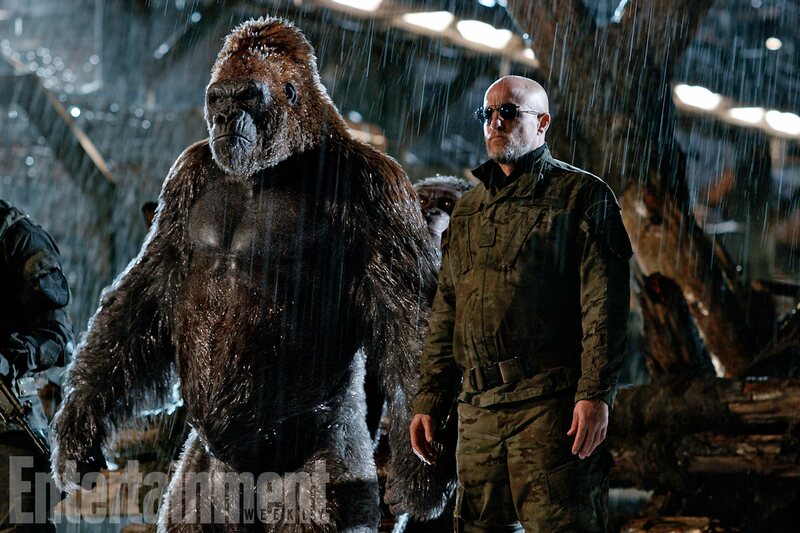 But if Caesar wants peace, July’s tentpole will have our CGI protagonist preparing for war, particularly after the introduction of Woody Harrelson’s fittingly badass Colonel. You’ll get a small tease of all that in the new TV spot up above, which 20th Century Fox released this weekend. It’s rather brief, but it does a great job of painting an intense and dark outing for the franchise, with Caesar promising to finish the war – one which he didn’t start. As we said before, both Dawn and Rise were impressive movies, but it really does look like this threequel might top them both. War For the Planet of the Apes, also starring Steve Zahn, Terry Notary (Kong: Skull Island), Amiah Miller, Judy Greer and Karin Konoval, gallops into theaters on July 14th. It’ll seemingly conclude Caesar’s harrowing journey, but what are your hopes for Matt Reeves’ oncoming tentpole? Do let us know below.